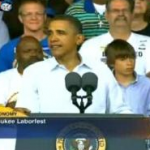 Mediaite has video of Barack Obama at his swaggering, cocky best. He was in Wisconsin over the weekend giving a speech in which he called for, among other things, a $50 billion dollar investment from Congress to improve public transportation. More interesting than his proposals, however, was his new ‘tude: with his rolled-up sleeves, dismissal of GOP opponents as idly “sipping on a Slurpee” (huh? 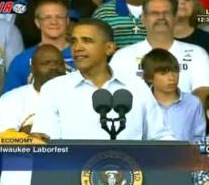 ), and deviation from the Teleprompter, the president appeared to be a new man. Whether this change has happened early enough to affect the midterms remains to be seen. To see the clip and read the full post, click here. On Geekosystem today: those shiftless, lazy ne’er-do-wells at Apple have done it again. Apparently the Photoshopping on some of their iPod Touch ads leaves something to be desired, as they depict features that can be found on the iPhone but not on the iPod Touch. This blunder raises the question — do the Apple ad guys just pass around one dude’s iPhone every time they have to shoot an ad? What gives, supposed geniuses? To get a link to the full story on Engadget and see for yourself, click here. Styleite has news sure to thrill/horrify carnivores everywhere — Vogue Hommes Japan photos have leaked featuring ubiquitous pop icon Lady Gaga wearing some kind of…meat outfit. Although one would think a woman who wore a pair of smoking-cigarette sunglasses would be running out of shocking things to wear, Gaga continues to deliver. The image is at once disgusting, startling, and kind of beautiful. If this is the photo they decided to leak, I shudder to think what’s in store in the rest of the book. Time will tell! Read the post and see the full photo here. Klassy! Sportsgrid has the story of soccer (football?) star Wayne Rooney’s sordid affair with a prostitute, made all the more reprehensible because it occurred during his wife’s pregnancy. The girl in question, Jenny Thompson, displayed a vulgar yet unsurprising candor in an interview with News of the World (…but of course). Apparently Rooney wooed her with a combination of covert making out in a casino and a lot of sexting. Also, Rooney is reportedly “not that ugly when you’re sat in front of him.” High praise! To see video of the obligatory mistress photo shoot and read the full post, click here. 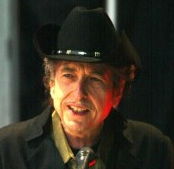 Gossip Cop reports on Bob Dylan’s highly anticipated art show, called “The Brazil Series” and unveiled in Copenhagen. Unfortunately, being one of the greatest lyricists of all time does not necessarily translate into talent in other art forms. The collection was almost uniformly panned, with one art history professor going so far as to comment that “Bob Dylan paints like any other amateur, using a rather oafish figurative style.” Ouch! To read more sick burns, click here.